"Smoked bacon adds zest to this bean bake recipe I got from my mother. I must confess that lima beans have never been among my favorite foods, but I actually like them in this casserole, and their color brightens up the mixture." Preheat oven to 350 degrees F (175 degrees C). Grease a 2 1/2-quart baking dish. 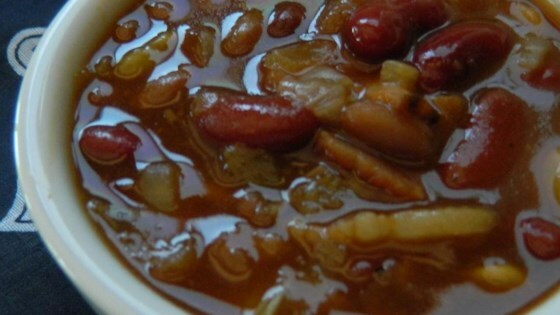 Combine pork and beans, kidney beans, lima beans, onion, brown sugar, ketchup, and dry mustard together in a bowl; transfer to the prepared baking dish. Sprinkle bacon over bean mixture. Cover dish with aluminum foil. Bake in the preheated oven for 30 minutes. Remove aluminum foil and continue baking until bubbling, about 30 minutes more. Butter beans can be substituted for the lima beans. Couldn't be simpler....tasty too! thanks for sharing! Awesome bean recipe! I put it in the slow cooker. Perfect as written!